JAPAN: Sony develops wireless tech for use inside electronic products | What Hi-Fi? 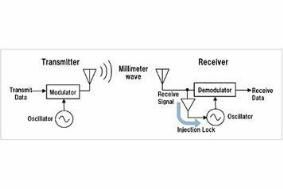 Its millimetre-wave wireless intra-connection system is designed to replace wiring and circuitry within products with an ultra-short-range 11Gbps radio system. And that could bring reductions in size, cost and complexity, while allowing much greater data capacity without resorting to complicated, power hungry integrated circuit packages. The system uses wireless data transfer operating over frequencies of 30-300GHz, with wavelengths between 1mm and 1cm. The high frequency allows ultra-high-speed data to be transferred, as well as requiring tiny antennae. In fact, the millimetre-wave system has been integrated on chips – combining transmitter and receiver – with a footprint of just 0.13 sq mm, and using antennae 1mm long. The transmission range is just 14mm, though this could be increased to 5cm using high-directivity antennae. Sony says that 'By replacing physical circuitry in electronics products with high speed wireless connections, this new data transfer technology reduces the number of wired connections and minimises IC use, to simplify the IC package and printed circuit board. "Furthermore, because the data transfer occurs without contact, this enhances the reliability of movable and detachable parts within the product."